Selected stories inspired from the recorded gems of the Delta blues, Chicago blues, Memphis blues and Texas blues. Called "the Devil’s music," the stories of the blues goes beyond jump turns, slow drag ditties, reel, jigs, minstrel songs, ragtime, or the buzzard lope. These lyrics connected to these stories celebrate heartache, separation, distrust, betrayal, lust, but they promise a healing love of revival and renewal. It’s a celebration of the present, of the now, and it’s totally mad at the past and suspicious of the future. But who are kidding? Let us tell the truth. Really, the themes of this raucous collection often wallow in carnal pain, in the weakness of the flesh, and the temptation of sin. Taboo love, forbidden love. Sometimes it’s just plain nasty. All of the good stuff. 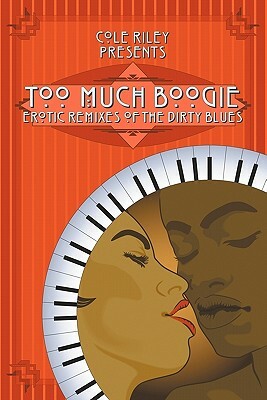 In Too Much Boogie, the spirit of the blues afflicts everybody. Within the emotional pull of the lyrics and its stirring music, there is a common language of the heart and the soul. Although the blues were born and bred in the land of Jim Crow by black people, it has nothing to do with class, color, or category. Even the rich get the blues and do dumb things. The book shows there is a pulse beating within each of us and that pulse is the blues. The disaster facing the Gulf Coast has been on the minds of millions of people and the ladies of the She Writes� - Southern Writers group expressed many feelings of anger, sadness, and disgust. We are not helpless, but what can we do? She Writes� members Zetta Brown and Nicky Wheeler-Nicholson Brown decided that something needed to be done where people can put their talents together and help make a difference. 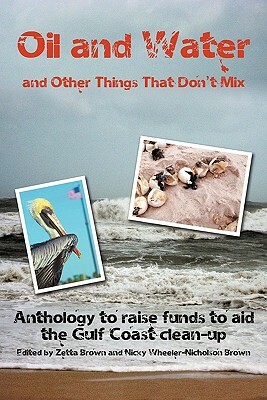 What better way than to produce an anthology where the proceeds will go where it is needed most? Oil and Water…and Other Things That Don’t Mix contains stories, poems, and recollections from 27 authors, women and men all dealing with the theme: "Conflict…Resolution Optional." These selections will make you laugh, cry, think, and some may even get you angry. These are stories from award-winning authors and journalists, newly published authors, as well as from talented new authors who make their debut in this volume. Jenne’ R. Andrews - Shonell Bacon - Lissa Brown - Mollie Cox Bryan - Maureen E. Doallas - Myl�ne Dressler - Nicole Easterwood - Angela Elson - Melanie Eversley - Kimeko Farrar - L B Gschwandtner - John Klawitter - Mary Larkin - Linda Lou - Kelly Martineau - Patricia Anne McGoldrick - Ginger McKnight-Chavers - Carl Palmer - Karen Pickell - Dania Rajendra - Cherie Reich - Jarvis Slacks - Tynia Thomassie - Amy Wise - Dallas Woodburn - Zetta Brown - Nicky Wheeler-Nicholson Brown All proceeds from Oil and Water…and Other Things That Don’t Mix will go to directly benefit MOBILE BAYKEEPER, and BAY AREA FOOD BANK, two charities helping to combat the effects of the spill and help the communities affected.